Brutal mech combat hits Manchester in Beyond Flesh And Blood - now also coming to Xbox One - Use a Potion! It may not be the most glamorous location in the world but Manchester, England is the setting for upcoming story driven third person mech shooter Beyond Flesh And Blood, coming for Playstation 4, PC and recently confirmed to be coming to Xbox One via the ID@Xbox scheme. “Set in the future after a terrible and vicious Global War, Earth is in ruins. The majority of the population now live on the edge of the Earth’s atmosphere, in an anchored orbital station called The Tree of Life. A meteorite hits Earth devastating all in proximity. Shortly after, reports of “alien” activity suspected to be linked to the impact begin to surface. An expedition is sent to study the impact site, but communications are lost. The whereabouts and wellbeing of the team are unknown. There are initially no hostilities between the U.G.R. (United Global Remnant: the peacekeeping force), and the “alien” Hive, leading to the perception of the new species as a passive and mindless race. The U.G.R. sanctions an expedition consisting of a small science team to study and try to make first contact with the aliens. It is decided that a team ‘Olive Branch’ will be sent as a physical human presence, with manned robotic suits have been settled upon for the mission. 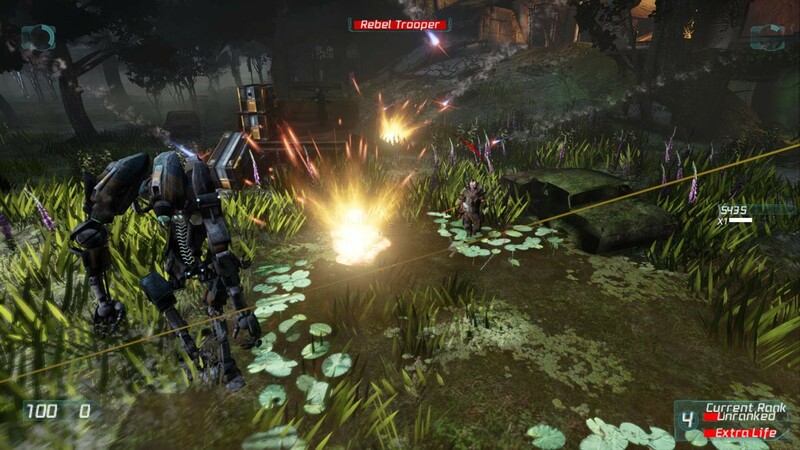 Beyond Flesh And Blood is hitting PC in September and arriving on consoles a little later in the year.